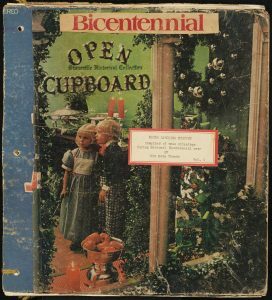 The newest batch of materials from our partner Rockingham County Public Library includes 3 scrapbooks, over 20 garden club yearbooks, 3 school yearbooks, and more. 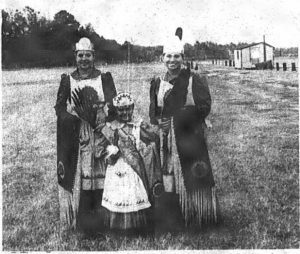 The scrapbooks are comprised of news clippings pertaining to the National Bicentennial Celebration of North Carolina Independence that took place from 1975-1976. Each volume collects articles chronologically in the order that they were published. 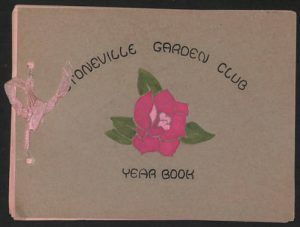 The garden club yearbooks document the Stoneville Garden Club from 1937-1999. These yearbooks feature lists of the year’s officers, committees, programs, and the club’s constitution. 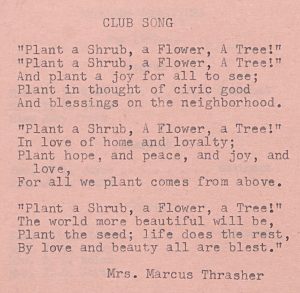 The yearbooks also feature the club’s song which starts “Plant a Shrub, a Flower, a Tree!” and decorative covers in the club’s colors–pink and green. Also included in this batch are the 1939 and 1940 editions of The Pilot by Leaksville High School and the 1944 edition of The Crest by Draper High School. 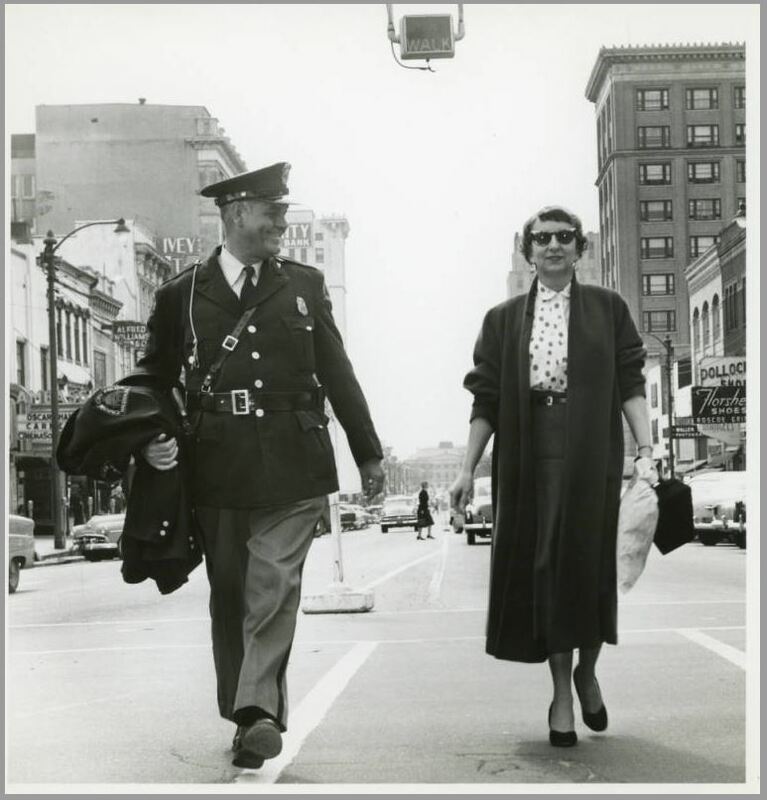 To see all of the materials in the Rockingham County Legacy exhibit, visit the exhibit’s homepage. To learn more about Rockingham County Public Library visit their partner page or take a look at their website. 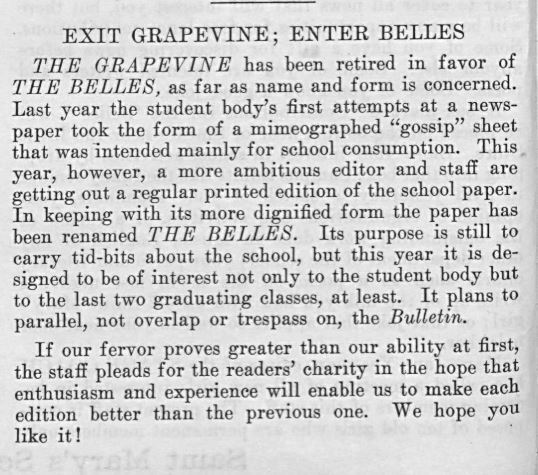 The Saint Mary’s School student newspaper, The Belles, is now online, from its origins as “The Grapevine” in 1936 through 1995. 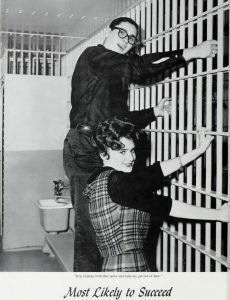 The Belles continues to be published in an electronic form to this day. 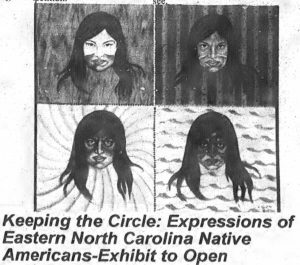 The paper gives a good look into the viewpoint of North Carolina teen women over a 60 year period. The paper reflect the changing times over almost 60 years of the school, chronicling everything from changing dress codes and fashions, the latest entertainment, and more internal changes such as post-high school aspirations and political engagement. 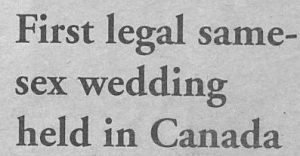 Perhaps the most interesting part of the papers are the editorials – both from the writers of the paper and the student body itself. Browsing through the editorials alone give a sense of what social and political issues of the time affected the student body the most. A brief trip through some interesting editorials in the Belles is a small trip through 20th century American history. 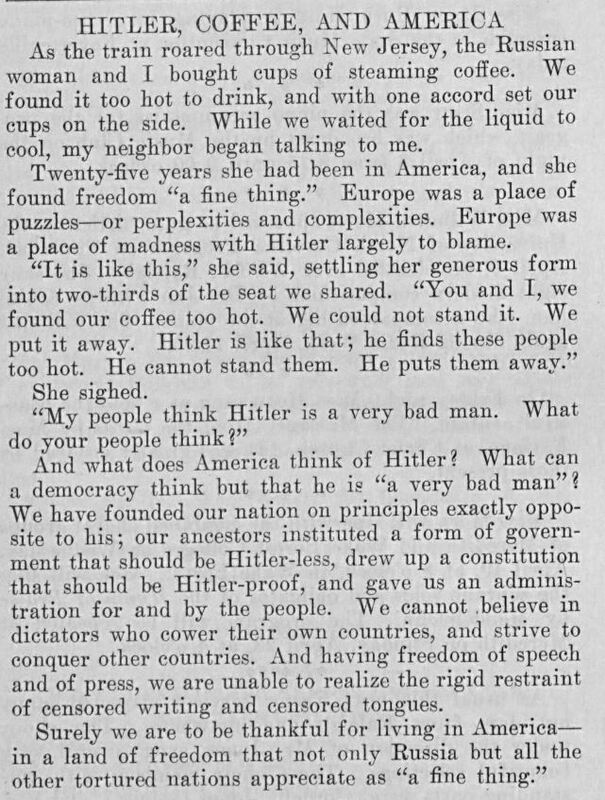 In 1939, a brief article was posted titled “Coffee, America, and Hitler,” reflecting on a conversation the author had with a Russian woman on a train. 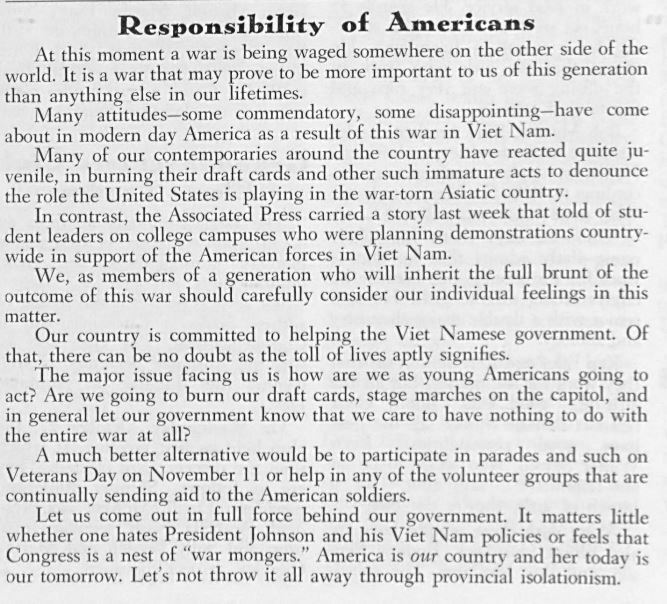 An editorial published in 1965 on the response in the United States by college students in particular to Vietnam seemed to both scold their fellow young Americans but also was a call to action to participation in civic life for the student body. 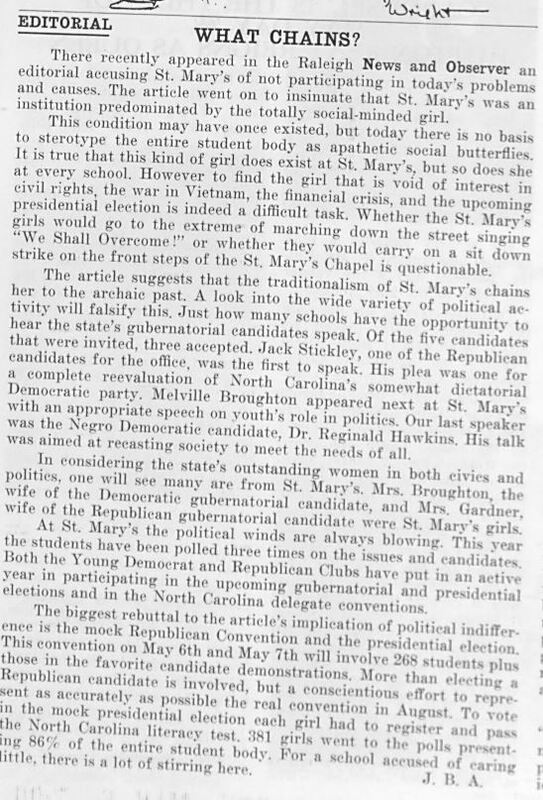 Amidst the strife of 1968, the editors of the Belles were put off by an editorial in the local paper that claims the women of Saint Mary’s didn’t care to participate in the political process or make their voice heard. 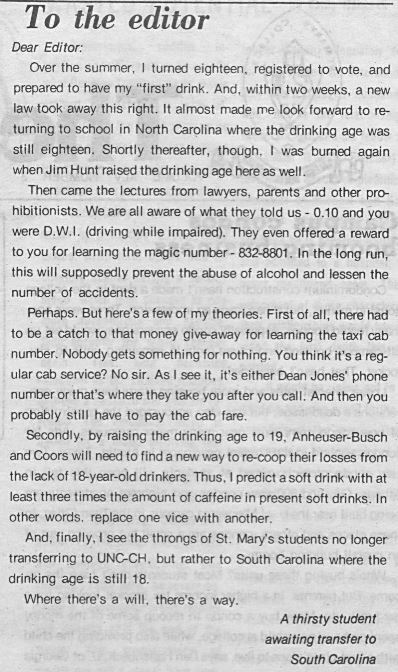 And an editorial in 1983 in response to the new DUI and drinking age laws passed show just how against these laws many teenagers and young adults in the country were. To learn more about the Saint Mary’s School, please visit the contributor page or the homepage. 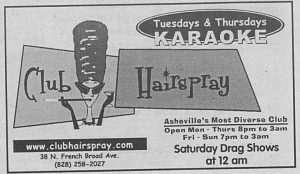 To see more newsletters like these, please visit the North Carolina Newspapers. We’re pleased to announce the Digital Heritage Center’s first set of strategic themes, which we’ve just released. These themes reflect what we’ve heard from partners and other institutions around the state over the last year. 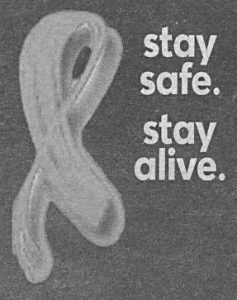 They join our longstanding but slightly revised Mission and Values statements. If you’ve followed our work for awhile, these themes will be familiar. But there are nuances here that will drive some of our newer initiatives, such as scanning on location and increasing the diversity of voices available through DigitalNC. Let us know if you have any questions or concerns. We look forward to working hard to help our partners share North Carolina’s cultural heritage. 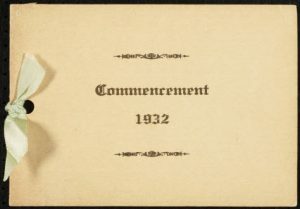 Graduation programs and invitations from the Henderson Institute, provided by the Henderson Institute Historical Museum, are now available on DigitalNC. 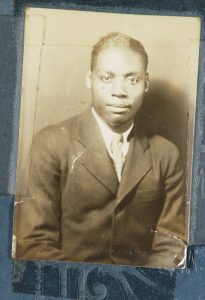 the Henderson Institute was a high school started in 1887 by the Freedmen’s Mission Board of the United Presbyterian Church. 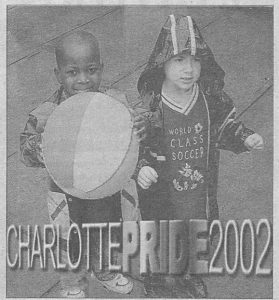 It was closed after the 1969-1970 school year due to integration. 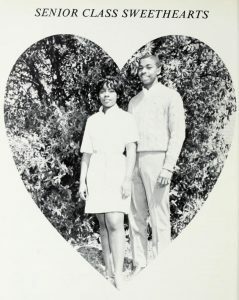 Through the years that the school was open, it was the only secondary school open to African Americans in Vance County. Part of the original school building now houses the Henderson Institute Historical Museum. The collection of 19 graduation programs and invitations date from 1924 through the school’s final 1970 graduation. 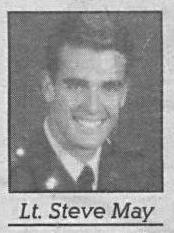 Although each program is structured differently, many include the full names of the members of the senior graduating class along with a schedule of events. 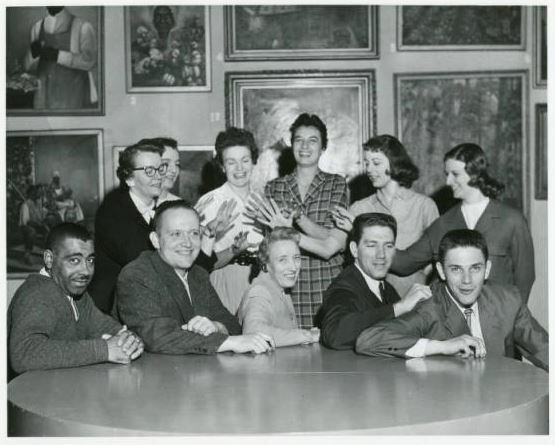 Also in this collection are five theater programs from the Henderson Institute. These include programs for student productions of The People Versus Maxine Lowe, Rest Assured, and Once in a Lifetime. Click here to browse through the programs. To learn more about the Henderson Institute Historical Museum, visit their partner page, or take a look at their website. 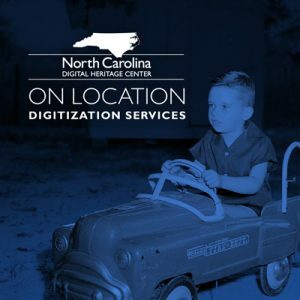 Have you been interested in working with the Digital Heritage Center but find it difficult to get to Chapel Hill, or have concerns about having your materials off site? We want to come to you! We’ll be working with two or three cultural heritage institutions over the next nine months to try out on-location scanning. If you’d like to nominate your institution, read on and use the nomination form linked at the end of this post. Here’s what nominated institutions will receive as part of this process. We will bring our scanners, computers, and staff to your institution to digitize and describe materials from your collections. We would be there for one full weekday, at a minimum. 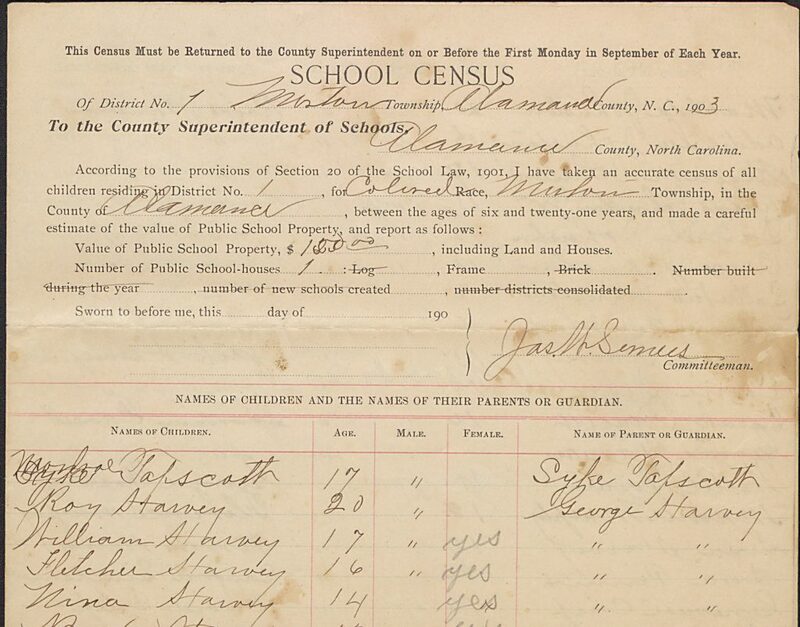 We’ll host the scanned images and associated metadata on DigitalNC.org, and give you copies of the original scans to use in any non-profit context. At least one conference call before arrival to clarify expectations, work with you on scheduling, and talk through the materials you’d like scanned. Description and a light inventory of the items we’ll be scanning, if there isn’t one already available. Some assembly and preparation of the materials you’ve chosen. This might include physically pulling all of the content together before we arrive and removing staples if the materials are stapled at the top corners. A designated staff contact regularly available to ask questions regarding what we’re scanning while we’re there, and to help with logistics like getting equipment in and out of the building, etc. is away from the public so we can get the most scanning accomplished in our limited time (ideal but not required). We’ll be giving priority to nominations from institutions furthest from Chapel Hill and to new partners. If you are a prospective partner, please check to make sure you’re eligible. The materials have to be owned by your institution. The materials should cover North Carolina subjects, events, and people. Materials can be fragile but should be stable enough to withstand gentle handling and placement on a flatbed scanner. Use this nomination form to submit! We’ll start reviewing nominations on September 30 and will notify selected institutions shortly thereafter. If a selected institution ends up not being able to host us, we’ll continue down the list. We’re excited about trying out this new service. Please contact us with any questions and share this with any institutions you think might be interested.